You know how I thought last week’s episode was fantastic, gleeks? Well, episode 2 was even better! Once again, this episode felt very season 1-esque, with only three solid musical numbers (and all Broadway songs, at that) and lots of time spent on plot and character development. This episode continued to set up a lot of great storylines and I can’t wait to see where they go, especially the super intense Quinn/Puck/Shelby subplot. But more on that in a moment…let’s break this episode down a bit more first! Favourite Character(s): Baby mama Quinn and baby daddy Puck share the trophy for best character this week, in my opinion. I’m completely stoked that these two are finally getting an interesting storyline again, and both of them did excellently in the spotlight this episode. Quinn’s range of emotion was spectacular and I can’t believe she’s going to actually try to get her baby back from Shelby. So crazy, yet I can’t wait to see this unfold. And Puck? Well, he just made me cry in his scene at Shelby’s house. His love and determination to be in Beth’s life was simply stunning. Best Song(s): Goodness, do I really have to pick just one? I thought all of the performances were excellent this week! Although not quite as amazing as their “I Dreamed a Dream” duet, Rachel and Shelby still knocked “Somewhere” out of the park, and both Kurt and Blaine had fantastic auditions, even though I agree that Kurt’s not the Tony type. Dude, you just can’t convince people that you can play a straight romantic male lead when you audition with a Streisand song. No matter how amazing you are at said Streisand song! 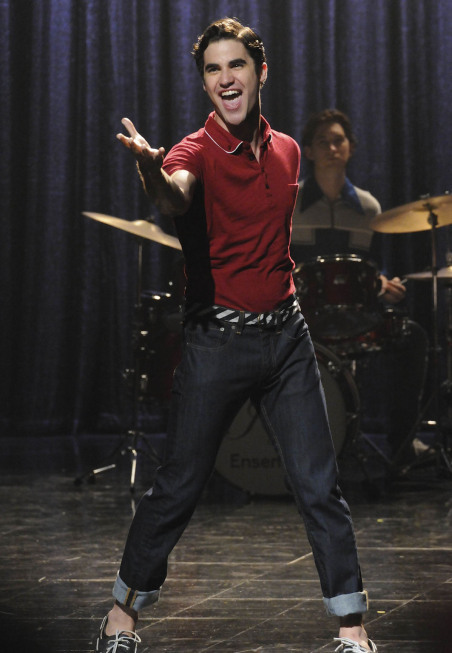 Blaine, however, showed off just how perfect of a Tony he would be with his stunning rendition of “Something’s Coming”. As Coach Beiste would put it, that number definitely “excited my lady parts”. Best Trio: Last week I praised the awesome twosome of Rachel and Kurt, and this week I couldn’t get enough of the terrific trio of Artie, Beiste and Emma. I definitely never would have thought to put these three characters together as musical co-directors, but they were completely hilarious! They played off each other perfectly and I can’t wait to see more of these three in the coming weeks! Teacher: What’s the capital of Ohio? Brittany. Beiste: In college I was in A Funny Thing Happened on the Way to the Forum. I played the forum. Beiste: I want a Tony that excites my lady parts. Sue: Hello She-Hulk, Weepy the Vest Clown and Little Miss Golden Marmoset. It’s a Brazilian monkey, and seriously, it’s your spitting image. I’m gonna send you a photo. Are you still at freakishbonyginger@gmail? Artie (to Blaine): I so want to give you a standing ovation right now. Weak Point: Wow, Will – hasn’t anyone ever told you that it’s kind of extremely inappropriate to yell at a student like you did at Quinn? Now, don’t get me wrong: everything he said was 100% true and Quinn needed to hear it. But I just thought that it was super inappropriate for Will to be the one yelling it. Definitely would’ve been better if one of her fellow New Directions members gave her a piece of their mind instead.